Chennai is the striking city filled with cultural heritage, nourishing atmosphere and top-notch infrastructure. The real estate market in Chennai is flourishing today and top real estate developers are coming up with the luxurious developments in the city. The well-known Hiranandani Group is coming up with its latest development, Hiranandani Parks that lends a lifestyle of pure comfort and indulgence. Hiranandani Group’s latest venture is an integrated and self-sustained township with the best social and civil infrastructure offering everything a modern homebuyer seeks. The project has contemporary design and detailed planning with a proof of high-quality and world-class architecture. Extended over 40 acres of luscious land, the residential development offers well-endowed variants apartments and villa plots ranging from 600 sq. ft. to 3000 sq. ft. The plots are nestled amidst 6000 trees, well designed and elegant street light poles with LED light fittings, well designed landscaping and uPVC lines with conical chambers to carry maximum sewage. 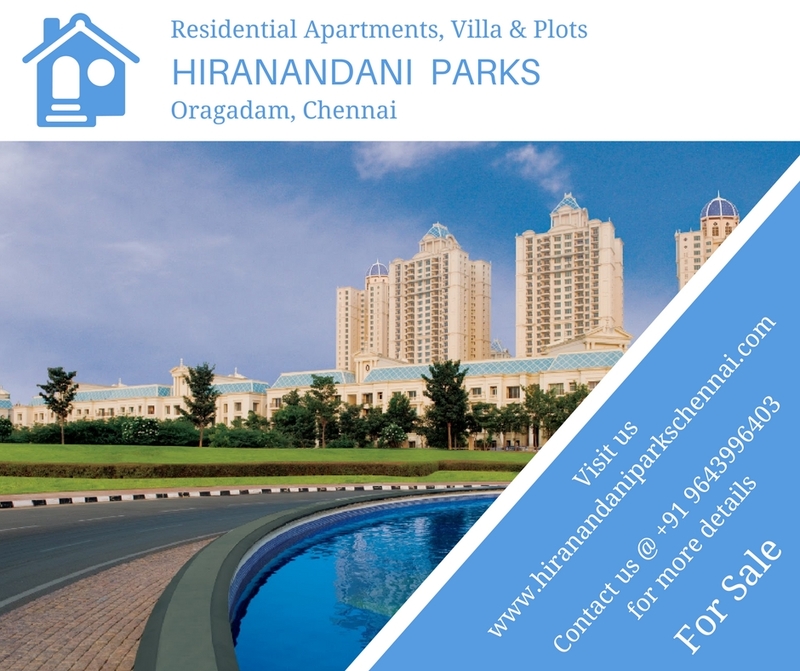 Hiranandani Parks Chennai is a grand township project that offers mesmerizing atmosphere to the residents, surrounded by premium extravagance and well-being. The layouts are well-planned with efficient usage of space, free air circulation and natural light. Wide balconies and large windows lend an open look and let you enjoy the lovely views of landscaped gardens and surroundings. The interiors are done with smart and trendy finish and elegant fittings. The township is completed with each and every amenity that you desire. From essentials like world-class hospital, a school and playground, retail stores and hypermarkets, to the luxurious facilities like swimming pool, clubhouse, a well-equipped gym, swimming pool and multiple sports facilities, Hiranandani Parks is designed to cater all your residential needs. The gated complex is fully secured with manned and CCTV security. There are a host of relaxation and healthcare zones within the complex including Yoga center, landscaped gardens, sitting zones, jogging track and more. 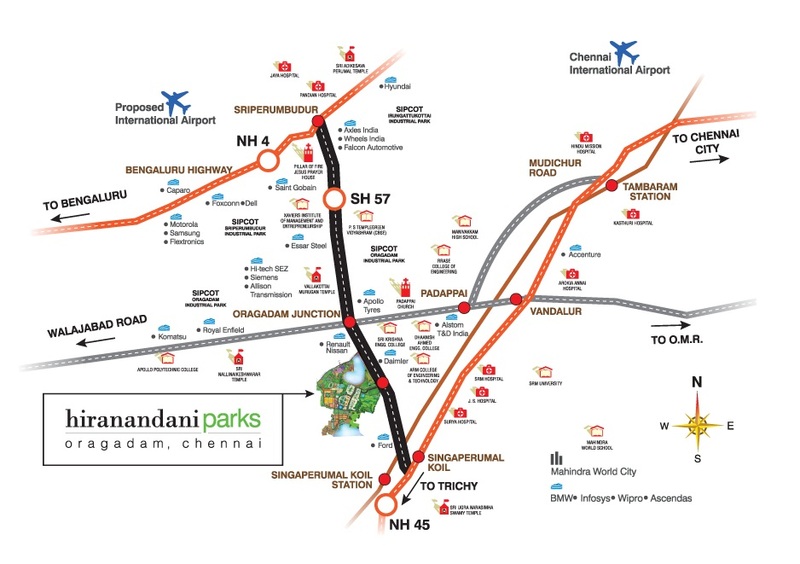 Located at Oragadam in Chennai, the development comes in close proximity to a number of landmarks, providing you extra convenience like never before. All kinds of public transport and civic infrastructures are in close proximity and you can reach anywhere in the shortest amount of time possible. The location enjoys easy connectivity to all the major locations in the city. The Hiranandani Group is well-known to offer the best at the lowest cost and the same applies on this latest residential development too. Hiranandani Parks price is simply amazing and truly affordable. Starting at a price of Rs. 13 lakhs that extends further up to Rs. 66 lakhs, investing in this development is truly beneficial. Multiple payment plans and easy home-loan facilities are also available to make your purchase easier. Hurry and grab the golden opportunity at an affordable price.